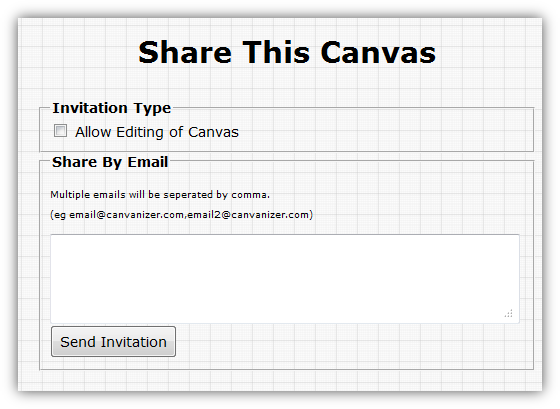 Once the canvas is created, you can share it with your teammates and others by clicking “Share canvas”. The window of sharing a canvas contains a check box that asks whether you allow others to edit the canvas or not. And a larger space for you to add more email addresses (which are separated by commas). Click “Send invitation” and finished. Sending and operating with “Admin link” help you and your teammates collaborate instantly. Anything that has been changed by you or your teammates will be presented in the canvas. While sharing “Readonly or public link” only allows your teammate to view the canvas, they cannot change. Hint: If you invite other people to work with you, all your edits are instantly replicated to all the people who have the same canvas opened at the same time. So this makes canvanizer a tool for e.g. skype conferences to brainstorm while not in the same room.